My writing tools are varied based on where/how I'm writing - laptop vs iPad vs iPhone. But the final review process almost always ends up on my Mac in Marked 2. Marked 2 is a peculiarly wonderful app in that it doesn't directly create anything. Marked 2 is just for viewing Markdown text files.2 So when I view my content in Marked 2, I can see the content using the same CSS styling as I use on my site. Normally when I run Marked 2, I will open a folder from Dropbox that holds all of my Markdown (MD) notes. 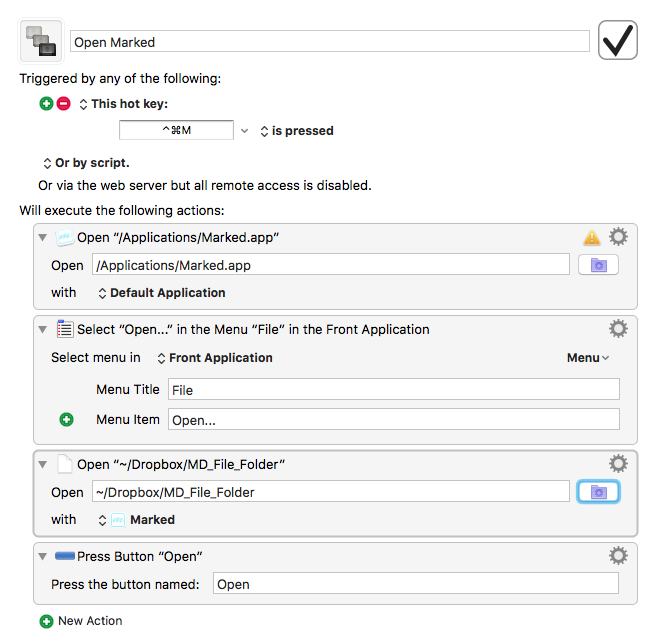 Marked 2 has the ability to open a folder and then change what document it being previewed based on what file has had the most recent revision. This makes my writing time so much more effective because I can make changes to one post, updates notes in another file, come back to a 3rd document - and I don't have to change anything in Marked 2. Since Marked 2 didn't have the option to open a folder, I looked at creating a macro in Keyboard Maestro. The goal was to create a keyboard short cut to open Marked 2 and have it open my normal MD file folder. With this macro, Marked 2 is opened and then will open my MD file folder.